Less time consuming and just as delicious. Preheat oven to 425 degrees F. Mix together 1 TBS grainy mustard, 1 clove garlic minced , 1 tsp olive oil, and 1 tsp majoram. Cut 1/4 of a small head of cabbage into wedges and spread cut cabbage wedges on a sheet pan and paint on mustard mix. Roast for 30 or until tender. Dice 1/2 of a small red onion. Over medium high heat brown turkey meat, add onion and cook until translucent. Add 2 cups spinach and cook until wilted. Season with salt and pepper. 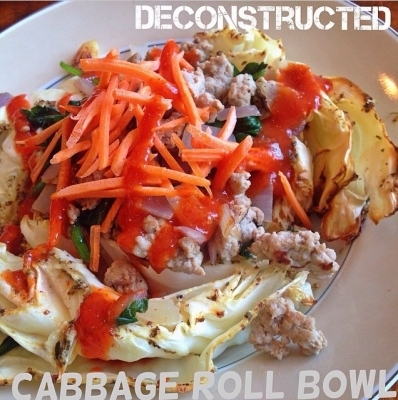 Arrange roasted cabbage wedges in a bowl and layer on top meat mixture. Top with carrot shreds. Stir 1 TBS of water into the tomato paste to thin out to a drizzable consistency. Drizzle on top and enjoy!